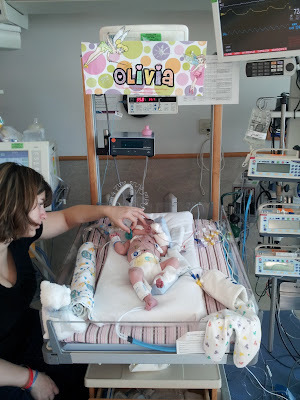 This is Olivias bed, with a cool Olivia sign one of the nurses made for her. 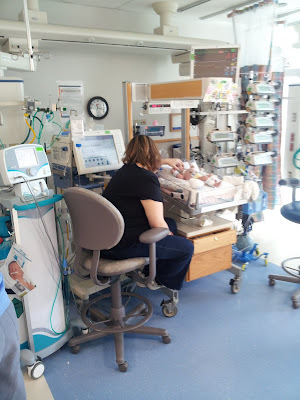 She is on a vent with a suction tube and a ng tube for feeding her 1ml of breastmilk an hour. She has 1 central line going right into.her chest. Leads for an external.pace maker are also coming out of her chest. She has a few ekg leads and the heart is her temperature sensor. She has an arterial line on her left hand and a regular iv on her foot. With a pulse ox on her right hand. Finally a blood pressure cuff on her right leg. 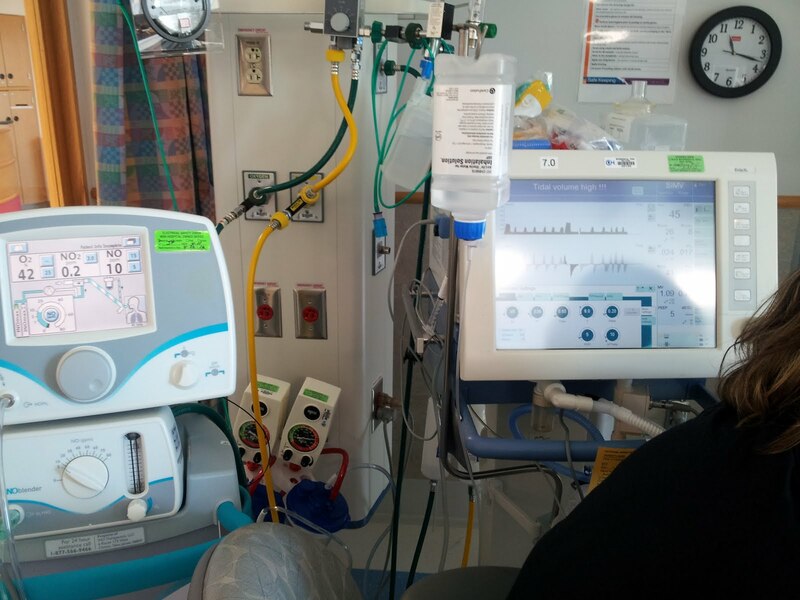 Sher bas 10 pumps pumping the central, arterial, and peripherial iv lines. 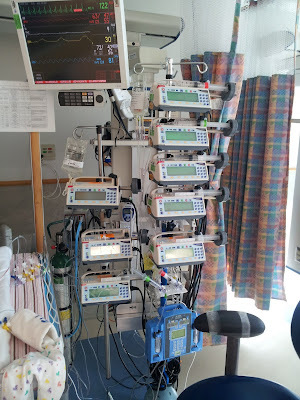 Starting at the top right are 3 continuous flushes to keep her central line open plus they all have a little heparin in them to also keep them open. Next is the milrinone which helps with the hearts contractility, which helps the heart squeeze better. Next is fentanyl which is for pain. Then 2 manual flushes, then a double pump with lipids, fats, and tpn, like gatorade. To the left is 3 ps and several bags of stuff. At the top pump was blood infusion to prepare her to be extubated then they switched it woith lasix to take off the extta fluid like a diuretic. Then a steroid to.help keep her airway from getting too swollen. Finally my favorite med, midazolam, it's a versed which calms her down and it really works great. It sounded like bedazzler to me its a funny name but awesome med. Above the pumps is her monitor. The top green is her heart rate. The red is her real time blood pressure, the white is her ra line which measures the pressures in her heart. Next is yellow which measures her respirations. Then is another white for blood pressure from the cuff. Finally is the last is blue for her spo2 oxygen saturations. We want it above 75 and right now it is in the 80s. This is all of her oxygen equipment. On the right is the ventilator. We watch the light grey waves to see her breathing over the vent. Then the Ppeak number to see how high the peaks of her breaths are. The first time they extubated her breaths were weak 10 to 14. This time they were 18 to 20. Everything else on the vent is a mystery to me. They lower the numbers on the bottom. I like the peep. To the left of that is her nitrous machine. It helps increase blood flow in the lungs. She used to be on 40parts per million, now it's 10 next it'll be 5. Supposedlt its tough to ween the last 5 of nitrous. We shall see. Thats the full tour. Slowly things will get taken away. I cant take a picture of it but there are 3 other beds in pod 3. Its a cozy pod and hopefully we won't move for awhile except to the step down ccu unit. Looking at these pics reminds me of all the junk that was hooked up to Fi and quite honestly I only knew what about 1/2 of it was. Will they let you hold her once the A-line is out? Hope so. Still praying back in NOLA.